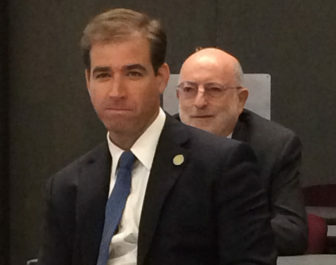 At a May 22 town hall meeting on Hartford’s dire budget situation, a resident urged Mayor Luke Bronin not to file for bankruptcy, saying it would be a “death knell” for the city. Almost since taking office at the beginning of last year, Bronin has proclaimed from the metaphorical rooftops that the capital city doesn’t have the resources to meet its increasing financial obligations and is at risk of insolvency. The city patched the last hole in the current budget with short-term borrowing and faces a projected $65 million gap in next year’s budget, with no new sources of revenue. Without additional help — $40 million more from the state and union concessions that mostly have yet to materialize — Bronin has said he will not rule out filing for bankruptcy. A Hartford bankruptcy is almost incomprehensible to those who remember the city’s thriving downtown and humming factories in the post-World War II years. But the reality is that after decades of slow decline, marked by middle-class flight, rising costs and loss of its once-imposing manufacturing base, the city is tapped out. Most agree that a bankruptcy filing by the state’s capital city would be a major embarrassment for the city and the state. That might not be the worst of it. The prospect of bankruptcy is frightening enough that most distressed cities try mightily to avoid it. Since Congress created what is now Chapter 9 of the U.S. Bankruptcy Code in 1937 to allow political subdivisions of states (but not states themselves) to file for bankruptcy protection, relatively few have done so. Since 1980 only 54 counties, cities or towns have filed for Chapter 9 protection, and more than a third of those filings were withdrawn or dismissed. Nonetheless, some highly publicized municipal bankruptcy proceedings have gone forward in the past decade, the best known of which include Detroit; Vallejo, Stockton and San Bernardino, Cal. ; Jefferson County, Ala.; and in New England, Central Falls, R.I. These communities were out of options. The trend — in Connecticut and across the country — has been for states to intervene and help distressed communities right themselves (a couple of states, Georgia, for one, don’t allow their towns to file for Chapter 9 protection). Chapter 9 is expensive; legal and management bills can run into the tens of millions of dollars. A 2015 study by the Pew Charitable Trust, titled “After Municipal Bankruptcy,” found fees in the Detroit bankruptcy approaching $170 million, while Jefferson County paid more than $25 million and Stockton nearly $14 million. These communities did get their debts lowered, but the fees took much of the bloom off the rose. Chapter 9 is time-consuming. The Vallejo bankruptcy took three and a half years, from 2008 to 2011, though Rhode Island intervened quickly in the 2011 Central Falls bankruptcy, allowing the former mill town to exit Chapter 9 in just 13 months, jig time in the bankruptcy world. Nonetheless the time isn’t necessarily productive; the damage to the city’s image can cause residents to leave and businesses not to invest, the 2015 Pew study says. “Businesses don’t move to cities that are in Chapter 9,” said Spiotto. Also, a Chapter 9 filing “immediately raises the likelihood of a credit-rating downgrade and, as a result, higher future borrowing costs for the government,” per the Pew study. Downgrades sometimes happen before any corrective action is taken. In addition, a city’s relationships with anyone to whom it owes money will be strained. Public workers could see reduced salaries and benefits. Residents might have to endure higher taxes or loss of services — consequences that also could precede bankruptcy. Finally, the outcome could be one nobody likes. Detroit, whose $18 billion municipal bankruptcy in 2013 was the largest in U.S. history, has seen new investment in downtown and some neighborhoods — some are calling it a “comeback city” — though other neighborhoods are still abandoned and forlorn. The Motor City is “recovering, but not recovered,” said Spiotto. 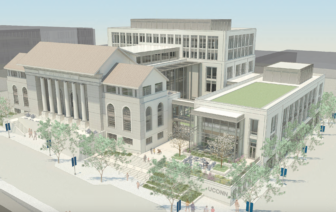 A rendering of the UConn Hartford campus nearing completion downtown. The new campus will add vitality downtown, but it also will be exempt from city property taxes. Central Falls, in the final year of its five-year recovery plan, has stabilized its finances, gotten its credit rating upgraded and begun a number of economic development initiatives, said Wilder Arboleda, the city’s business outreach and public relations coordinator. So although bankruptcy isn’t quite a death knell, the more common response to a city in distress is fiscal and technical assistance from the state, along with a period of state oversight. Some states, such as Pennsylvania and North Carolina, have boards that regularly monitor the finances of their cities, to be able to intervene before troubles reach the crisis stage. Gov. Dannel Malloy has proposed such an oversight board for Connecticut, which legislators are still considering. Such a board probably would have intervened in Hartford sooner than 2017; the city has been struggling for several years, selling assets and repackaging debt to balance its budget. To date, Connecticut has responded ad hoc — and usually late in the game — when one of its municipalities has foundered on fiscal shoals. In the last three decades, the state has stepped in to oversee the finances of Bridgeport, Waterbury, West Haven and Jewett City, a borough of Griswold. Bridgeport actually filed for bankruptcy in 1991, but its petition was rejected when the city could not prove it was insolvent, one of several requirements for bankruptcy approval. State officials opposed Bridgeport’s petition, not wanting to see the state’s largest city go bankrupt, then offered help — buying a park and a zoo — to get the city through the crisis. In 1994 the General Assembly passed a law requiring the governor’s written approval before a municipality can file for bankruptcy. Gov. Malloy has said he hopes Hartford can avoid bankruptcy. At this point it looks like there will be another ad hoc intervention. The legislature is working on a solution for Hartford, “looking at a myriad of options,” said House Democratic majority leader Matthew Ritter. All would include strings, some level of state oversight. But it’s not clear that this approach will solve the real problem. Bankruptcy — or state receivership — is the symptom of a larger problem — that being whatever it was that caused the insolvency. Cities get into fiscal jams for a variety of reasons: mismanagement, a spectacularly poor infrastructure investment, loss of a major employer, unsustainable union contracts, corruption or a slowly declining tax base. Bankruptcy can buy time, lower debt and protect the city from lawsuits, but it doesn’t solve the underlying problem. “Just because you go into Chapter 9 doesn’t mean you have more revenue,” said Spiotto. Ideally, bankruptcy or receivership will result in a long-term fiscal plan that will align spending with revenues, and a plan to address the problem that put the city in the hole. Hartford has awarded generous union contracts in the past — a good number of police officers have retired with pensions that are higher that their working salaries — and made some questionable investments (a baseball stadium that was finally built and a soccer stadium that wasn’t) in recent years, but it has had nowhere near the mismanagement that plagued Bridgeport or Waterbury before those cities submitted to state oversight. The city’s fundamental problem is that it doesn’t have enough taxable property to support itself. Connecticut is heavily reliant on the property tax; it is virtually the only way municipalities can raise revenue. Hartford occupies only 18 square miles, and more than half of its property is off the taxable grand list — hospitals, colleges, government buildings, etc. The city has far and away the highest tax rate for commercial property in the state, 74.29 mills, and Mayor Bronin is loathe to raise it. Lack of an adequate tax base is a characteristic of several distressed cities. Central Falls, for example, has 19,000 people on an astoundingly small 1.2 square miles. One of the efforts to revive the city has been a task force aimed at getting foreclosed properties back on the tax rolls, said principal planner Trey Scott. With less taxable property than some of its suburbs, but with the bills for many of its region’s social ills, Hartford can only raise about half the money it spends, and must rely heavily on state assistance. Bronin said he has cut 100 jobs and $20 million from the budget, but still has fixed costs — pensions, health care and debt service — that are rising. He said the city is being run efficiently, and he would welcome someone looking over his shoulder. An oversight panel might give the city some leverage with its unions — one of which voted down a contract last month that would have saved the city $4 million over six years. But though union concessions are probably essential to gaining more state help, they won’t by themselves balance the budget. A one-time bailout won’t work either; the city needs a revenue source for a period of years to meet rising debt and pension obligations. The legislature could provide ongoing help by adding to the sales tax, or, as Bronin noted in his budget message, by fully funding state reimbursements for nontaxable property, known as payments-in-lieu-of-taxes, or PILOT, a program that has been chronically underfunded for decades. Fully funding PILOT would provide Hartford with enough money — an estimated $50 million a year — to stabilize its budget. As Hartford officials are well aware, it is not a good time to ask. The state faces a daunting deficit of more than $5 billion over the next two years. Lawmakers have gone into special session to work on the budget, and are not expected to have a solution for Hartford until the state budget is completed. Though it will be challenging to find more money for Hartford, Bronin argues that it is essential that the state create more economic and social vibrancy in its major cities, making them a draw for bright young people, because that’s what businesses are looking for today. The departure of GE from its suburban Fairfield campus to Boston and the impending departure of Aetna’s headquarters from Hartford would appear to support his argument. Some distressed cities across the country have gotten back on the road to prosperity, via sound economic planning. Pittsburgh, for example, invested in medicine and technology, along with arts, infrastructure and riverfront activity, which have helped the city recover from the crushing loss of the steel industry in the latter half of the last century. 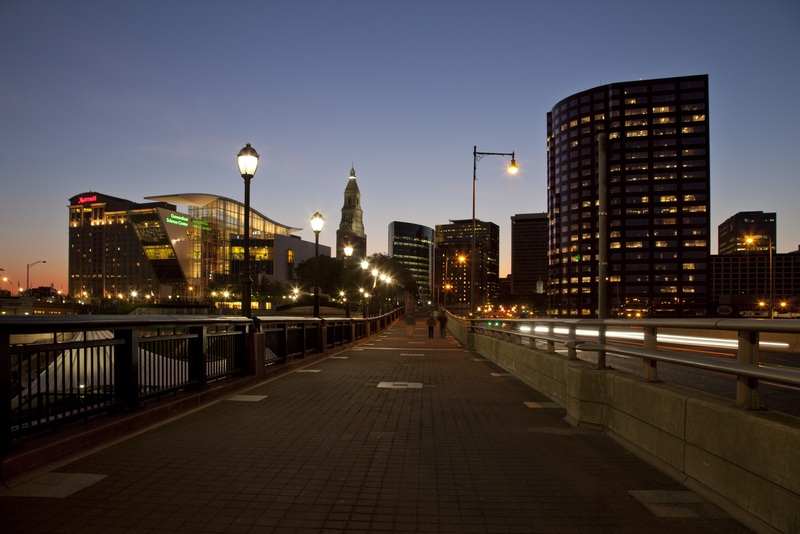 Hartford has a number of initiatives underway — downtown housing, a new UConn branch, bus and train transit, plus a longstanding riverfront revival program — that should help its economic growth. It is one of four cities awarded a share of $30 million by CTNext to create high-tech innovation hubs. It just needs, somehow, to bridge the budget gap. This is not a drill. Hartford may once have been “the richest little city in the country” — a comment attributed to the renowned novelist Henry James — but it is no longer.